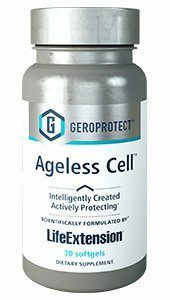 Ageless Cell™ is the first supplement in our breakthrough GEROPROTECT™ line. It delivers unique ingredients that together help to inhibit cellular senescence, a natural part of the aging process where tired cells no longer function optimally. Senescent cells affect organ function, cellular metabolism, inflammation response, and more. Plus, as we age, our natural ability to expel these cells from our vital systems declines. The accumulation of these senescent and pre-senescent cells plays a major part in biological aging. The Ageless Cell™ formula was created through a unique partnership with Insilico Medicine, Inc., who harnessed 21st century deep learning algorithms to comb through hundreds of studies and thousands of datapoints to identify the right nutrients — a process that could have taken decades. Life Extension® then combined these unique ingredients into a single innovative formula. By rejuvenating near-senescent cells and encouraging the body’s healthy process for dealing with senescent cells, Ageless Cell™ helps turn back the clock at the cellular level. Ageless Cell™: the cellular longevity breakthrough you’ve been waiting for.